The sub is big on style, but is it big on sound as well? Despite the controls on Amphion's impact 500 (no capital letter, we're talking Scandinavian minimalism here) seeming so primitive, it has hidden sophistication inside. As well as anti-clipping and overload protection circuitry – a bit like the technology REL models feature – Amphion also uses a crossover with a frequency variable slope that it calls Cumulative Stage Coupling. It's all about phase coherency, and the manual offers six different range-specific settings to use for the crossover and gain knobs as referenced to Amphion's own named product ranges. At its most effective, the onboard crossover offers a wall of a 30dB slope above 150Hz. It steepens as you go higher. 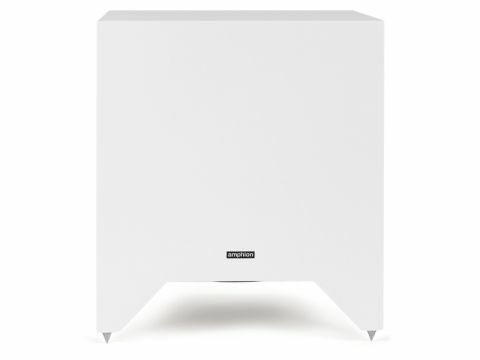 Amphion likes to think of itself as a force to be reckoned with in high-end hi-fi yet it only makes two subwoofers (the other is the dinkier impact 400, which uses a 10in rather than 12in driver) and its philosophy is all about musicality, rather than brute force. So, can it cut the cinematic mustard? To find out, the impact 500 was given the unenviable task of trying to keep up with my resident set of Bowers & Wilkins 800 series speakers. First up I played some Sting in DTS – Heavy Cloud but No Rain if you must know – and, as I expected, found the sub's metier. It's fast, tight, melodic and profound, with great rhythmic abilities and hardly any overhang. For movies, I decided that King Kong and some dinosaurs would suffice. I spun up the Blu-ray and tried to concentrate on the bass end, opting for the scene where Kong sets about a Tyrannosaurus Rex. In fact I ended up watching lots more. The truth is, though, that Peter Jackson-style beasties aren't the Amphion's cup of tea. Despite all the cleverness of the steepening-slope crossover, and reading about the protection circuits, I found overloading the poor thing too easy. It is posh, very posh (I was terrified of marking the soft matt finish) and perhaps it's too grown up for action movies. It'd be perfect for the polite cinephile who values fidelity over excitement, but others might end up hankering for more grunt.